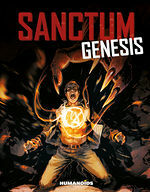 Journey to the roots of the nightmare as the Nazi party attempts to control the ancient evil entity that was introduced in the bestselling series Sanctum. Aleppo, Syria, 1934. 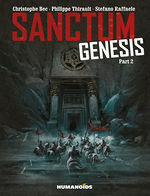 Following a major archeological discovery, German soldiers from the esoteric branch of the Nazi party forcibly take over the site and hold the French-led archeological team hostage. The Nazis are after an ancient weapon that they hope can further their world conquering plans, but in the process of uncovering it they awaken Môt, a primeval divinity that proves utterly impossible to control. A tale of suspense, action-adventure, and horror for fans of Indiana Jones and Lovecraftian horror. 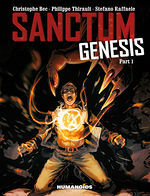 Genesis has its own intense atmosphere of claustrophobia and ought to please anyone who’s first read Sanctum. Anyone who hasn’t will wonder why there’s any quibbling about a first rate thriller. "It’s a gripping, tense tale of colonial arrogance, greed and ancient, primeval horror"